Laparoscopic cholecystectomy has established itself firmly as the “gold standard” for the treatment of gallstone disease. Existing literature has focused most exclusively on the biliary complications of this procedure, but other complications such as significant hemorrhage during laparoscopic cholecystectomy have not been documented. Tranexamic acid is a synthetic antifibrinolytic drug released in 1970. The mechanism of action for synthetic antifibrinolytics is competitive blockade of the lysine-binding sites of plasminogen, plasmin, and tissue plasminogen activator. The reversible blockade impedes fibrinolysis and blood clot degradation. Plasmin inhibition by tranexamic acid may also help prevent platelet degradation. The half-life of tranexamic acid is approximately 80 min, provided there is normal renal function. Intravenous administration of tranexamic acid has been routinely used for many years to reduce hemorrhage during and after surgical procedures such as coronary artery bypass and scoliosis surgery. Tranexamic acid has been found to be very useful in reducing blood loss and the incidence of blood transfusion in these surgeries., This study was conducted to assess the role of tranexamic acid in the prevention of excessive bleeding in laparoscopic cholecystectomy. This was a prospective study. Sixty patients suffering from cholelithiasis and undergoing laparoscopic cholecystectomy were divided into two groups randomly by slip method. All cases were performed by experienced laparoscopic surgeons. Patients who had bleeding due to trocar injury to major blood vessels. Baseline investigations such as hemoglobin (Hb), brachytherapy, computed tomography, total leukocyte count, differential leukocyte count, fasting blood sugar, renal function tests, pressure-time index, liver function tests, urine complete examination, and abdominal ultrasonography done. Group A received an intravenous dose 20 mg/kg of tranexamic acid at induction of anesthesia. Group B did not receive any dose of tranexamic acid. The standard 4-port laparoscopic cholecystectomy was performed in each case. The cystic artery and duct were clipped with liga clips and divided. After extraction of the gallbladder, 100 ml of normal saline was instilled into peritoneal cavity (subhepatic space), and a closed drain was inserted. Ports were closed in a standard fashion. Heart rate and blood pressure were checked at 1 h, 24 h, and 48 h after surgery. Drain output was recorded daily, and drain fluid hematocrit and hemoglobin were performed after 48 h, and all the patients were followed up daily postoperatively till discharged. Hb level was performed after 48 h and was compared with the preoperative levels. The two groups were compared, and the data collected were entered and tabulated using Microsoft Office Excel and analyzed using appropriate statistical tests. The results of the two groups were compared in terms of limiting blood loss, postoperative hospital stay, and mortality and morbidity of the patients. [Table 1] shows that Group A included 8 male patients and 22 female patients, whereas in Group B, there were 10 male patients and 20 female patients. Combined ratio of female to male patients in Group A and Group B was 2.33:1, which implies that the gallstone disease is more common in females. [Table 2] shows the associated comorbidities in both groups. A total of 25 (41%) patients had associated comorbidities. The mean age of the patients in Group A was 44.4 years and that of Group B was 44.33 years (P = 0.9837). Thus, the difference of the ages in both groups was not statistically significant. The mean postoperative hospital stay, drain fluid Hb, drain fluid hematocrit, drain fluid output, mean pulse rate at the start of surgery, mean pulse rate 24 h after surgery, and mean change in Hb in both groups were not significant [Table 3]. With the use of tranexamic acid, no major adverse effects were recorded. The advent of laparoscopic cholecystectomy has been a significant milestone, not only in the treatment of gallstone disease but also in the evolution of minimal access surgical approach. The principle is to minimize the trauma of access without compromising the exposure of the surgical field. Laparoscopic cholecystectomy is now considered as the “gold standard” treatment for symptomatic gallstone disease. Tranexamic acid exerts its antifibrinolytic effect by blocking lysine-binding locus of plasminogen and plasmin molecules, thereby preventing the binding of plasminogen and plasmin to the fibrin substrate. Tranexamic acid also inhibits conversion of plasminogen to plasmin by plasminogen activators. It has been used in the treatment of bleeding for many years. Hence, our experience regarding the role of tranexamic acid in preventing blood loss in laparoscopic cholecystectomy has been discussed, taking into account the various parameters. In this study, the mean age of the patients was 44.36 years, which is comparable to the studies by Gordon et al. in 1976 and Danlel et al. in 1982, in which the mean age of the patients undergoing cholecystectomy was 47 and 45 years, respectively. The majority of the patients were females in both the groups, i.e., 73.33% in Group A and 66.66% in Group B. The percentage of females in our study (70%) is consistent with the study conducted by Kambouris et al. on cholecystectomy in 1973, in which the percentage of female patients was 72.6%. Five patients (8.33%) were diabetic, five patients (8.33%) were hypertensive, three patients (5%) were drug addicts, and nine patients (15%) were alcoholics. Our findings are comparable to the findings obtained by Koc et al., who found out that 12 out of 92 patients (13.3%) in their prospective double-blinded randomized study on laparoscopic cholecystectomy were diabetic. Diabetes mellitus increases the incidence of infection, and one of our patients had this complication. The mean hematocrit of the drain fluid for Group A was 0.2434% and for Group B was 0.2627%. Hematocrit of drain fluid was less in the study group showing that blood loss was less in the study group as compared to the control group. The mean hemoglobin in the drain fluid of the patients of the study group was 0.83 g%, which was less than the control group with mean value of 0.9 g%. Hence, blood loss was less in study group as compared to the control group, but the result was not statistically significant. Gohel et al. in 2007 concluded that tranexamic acid is effective in decreasing blood loss during and after cesarean section. There was less blood loss in the study group who received tranexamic acid as a bolus dose as compared to the control group who did not receive tranexamic acid as a bolus dose in laparoscopic cholecystectomy. Tranexamic acid showed decrease in blood loss in the study group, but it was statistically insignificant. The mean days of hospitalization in our study Group A were 2.4 days, which was less as compared to mean days of hospitalization in Group B, i.e., 2.63 days. However, the result was statistically insignificant. These results were similar to the study by Choi et al. on the effect of tranexamic acid on blood loss during orthognathic surgery (bimaxillary osteotomy), in which there was no significant difference in the length of hospital stay between the two groups. There was no significant alteration in mean pulse of the patients in the study group following administration of tranexamic acid 24 h after surgery, signifying minimal blood loss, intra- and postoperatively. Similarly, there were no significant alterations in the vital signs of the patients of the control group 24 h after surgery. In our study, the mean change in hemoglobin in the study group was 0.373, which was less than that of the control group, i.e., 0.471. Similar findings were seen by Gohel et al. 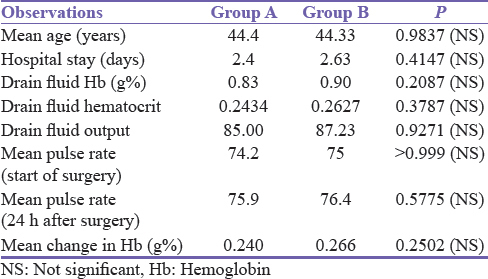 in 2007 showing no significant difference in the preoperative and postoperative mean hemoglobin of the two groups in their study on the efficacy of tranexamic acid in decreasing blood loss in cesarean section. Hence, in our study, tranexamic acid did reduce blood loss, but it was statistically insignificant. The use of tranexamic acid decreased the intraoperative and postoperative bleeding in laparoscopic cholecystectomy, but it was not statistically signifi cant. This may be due to minimal blood loss in the laparoscopic procedures. There is no active role of tranexamic acid in limiting blood loss in elective laparoscopic cholecystectomy. Utpal DE. Evolution of cholecystectomy: A tribute to Carl August Langenbuch. Indian J Surg 2004;66:97-100. Hardy JF, Desroches J. Natural and synthetic antifibrinolytics in cardiac surgery. Can J Anaesth 1992;39:353-65. Horrow JC, Van Riper DF, Strong MD, Grunewald KE, Parmet JL. The dose-response relationship of tranexamic acid. Anesthesiology 1995;82:383-92. Brown RS, Thwaites BK, Mongan PD. Tranexamic acid is effective in decreasing postoperative bleeding and transfusions in primary coronary artery bypass operations: A double-blind, randomized, placebo-controlled trial. Anesth Analg 1997;85:963-70. Ido K, Neo M, Asada Y, Kondo K, Morita T, Sakamoto T, et al. Reduction of blood loss using tranexamic acid in total knee and hip arthroplasties. Arch Orthop Trauma Surg 2000;120:518-20. Underwood RA, Soper NJ. Laparoscopic cholecystectomy and choledocholithotomy. In: Blumgart LH, Fong Y, editors. Surgery of Liver and Biliary Tract. London: WB Saunders; 2000. p. 709-736. Gohel M, Patel P, Gupta A, Desai P. Efficacy of tranexamic acid in decreasing blood loss during and after caesarean section: A randomized case controlled prospective study. J Obstet Gynecol India 2007;57:227-30. Gordon AB, Bates T, Fiddian RV. A controlled trial of drainage after cholecystectomy. Br J Surg 1976;63:278-82. Danlel CB, Rober CC, William JF. Cholecystectomy with or without drainage. Am J Surg 1982;143:307. Kambouris AA, Carpenter WS, Allaben RD. Cholecystectomy without drainage. Surg Gynecol Obstet 1973;137:613-7. Koc M, Zulfikaroglu B, Kece C, Ozalp N. A prospective randomized study of prophylactic antibiotics in elective laparoscopic cholecystectomy. Surg Endosc 2003;17:1716-8. Choi WS, Irwin MG, Samman N. The effect of tranexamic acid on blood loss during orthognathic surgery: A randomized controlled trial. J Oral Maxillofac Surg 2009;67:125-33.